Whifferdill Estates | What's a Whifferdill? Whifferdill Estates was given its name by an old aviator named Frank Knapp. Mr. Knapp devoted his life to aviation. He was a pylon racer, weather observer, crop duster, airshow pilot, instructor, fixed based operator, and in later years he was involved in airport administration. While a weather observer in the early 1930's, he would dress in the heavy clothing for the open cockpit airplane, strap the weather instruments on the wing wires and about 3:30 A.M. take off and climb until he blacked out. The observers tried to reach 17,000 feet. The idea was to regain control before they crashed. They did most of the time, however, due to the winds sometimes it was in another state. While on the ground he would keep the young pilots entertained and educated by telling his flying stories (never the same one twice) during their down time. Mr. Knapp saw the property prior to any development work having been performed. The Developer explained to Mr. Knapp his intentions with the property and Mr. Knapp said it should be called Whifferdill. He said, "in the old days when you went out to fun fly and do aerobatic maneuvers you said you were going to do a Whifferdill." It is the perfect name. 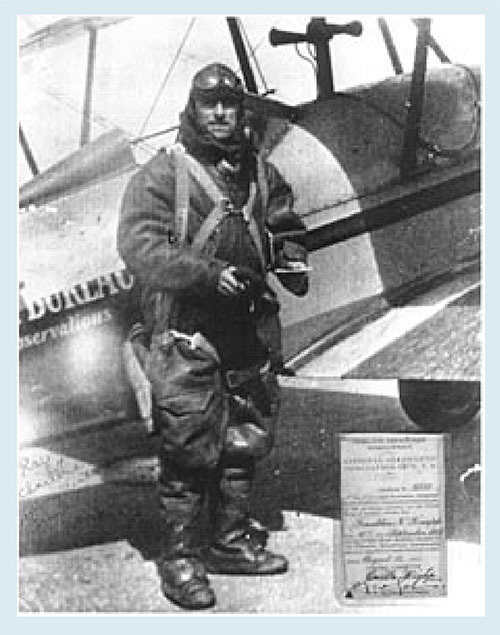 Mr. Knapp pictured just before taking off on a weather observation flight in the early 1930's. 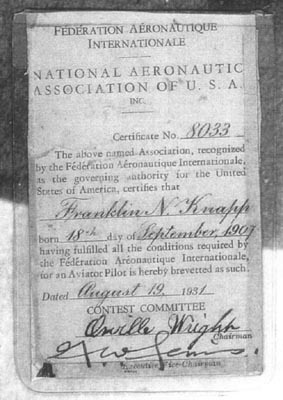 Notice his licenses were signed by Orville Wright. The developer is Ray Williams. Ray has been in aviation since 1963. He now has nearly 30,000 hours and flying is still his first love. He holds Commercial/Instrument and Instructor Certificates in Single, Multi-engine Land, Sea, and Helicopter. He is an A & P Mechanic and an AI, in addition to being an ACE (Aerobatic Competition Evaluator) for the International Council of Air Shows.